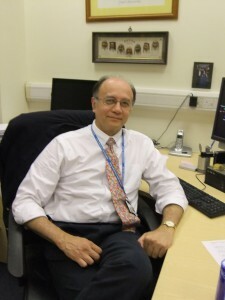 David Menon is Professor and Head of the Division of Anaesthesia, Principal Investigator in the Wolfson Brain Imaging Centre, and Co-Chair of the Acute Brain Injury Programme at the University of Cambridge. In 2013 he was re-appointed as an NIHR Senior Investigator as one of the NIHR’s pre-eminent researchers. In 2006 he was appointed to the British Oxygen Professorship at the Royal College of Anaesthetists. He is Co-Chair of the Executive Board of the European Brain Injury Consortium, is a Founding Fellow of the Academy of Medical Sciences, and a Professorial Fellow in the Medical Sciences at Queens’ College, Cambridge. Professor Menon’s research interests include neurocritical care, secondary brain injury, neuroinflammation, and metabolic imaging of acute brain injury. He has also published on the physiology of coma and the vegetative state, and on mechanisms of anaesthetic action in the brain. In recent years he has represented the UK intensive care community in discussions regarding the impact of evolving legislative changes on research in critical care and emergency medicine.